Black God, known as Haashchʼééshzhiní in Navajo, is the god of fire and creator of the stars according to Navajo tradition. In his Navajo mystery series, Tony Hillerman often refers to Black God as Darkness to Be One. Not all accounts credit Black God with the creation of the constellations, but most credit him with the creation of fire and light as found in the stars. He has a crescent moon on his forehead, a full moon for a mouth, the constellation Pleiades on his temple, and he wears a buckskin mask covered in sacred charcoal with white paint. It is said that whenever Black God stomps his foot, the Flint Boys would up on him, eventually remaining on his forehead and representing the Pleiades. 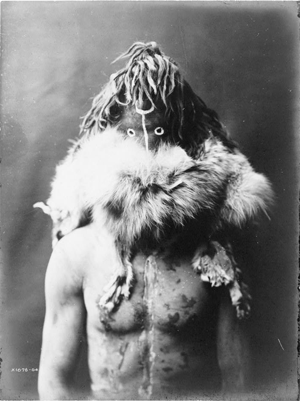 "Black God (Haashchʼééshzhiní), the God of Fire in Navajo mythology, circa 1904" by Edward S. Curtis is licensed under Public Domain. Sandpainting. Albuquerque: University of New Mexico Press. 1950 Navajo Religion Vol. 2. Princeton: Princeton University Press.